This week I thought I'd share this rather artsy black & white photo of me from when I was little...probably about 6? I'm not quite sure. I think my mum said this was taken on a train. 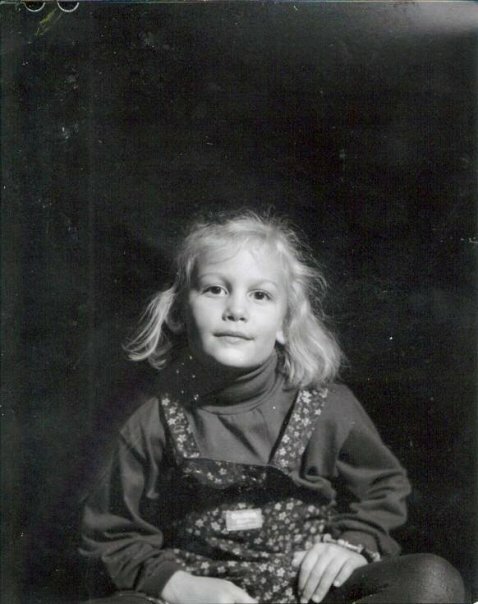 An OshKosh dungaree dress & a polo neck - you could tell I was a '90s kid, hahaha! Who do you see here, Emilia or Eduardo?! I think Eduardo in this picture. What do you think? Eduardo for sure!emilia looks like her dad as she grows up and eduardo is a mini you!i remember a photo with him and your brother and they both looked so alike! Yeah I can see Eduardo here :) You look so cute, and it´s such a cool photo. Love black and white pics. I also see Eduardo back in this picture. Very cute! To me, you actually look exactly like your mom in this! Definitely Eduardo! Adorable pic, Anna. I can see both!! You were so blond!! I always see you in Eduardo! I see Eduardo! Although you look more like Emilia in other pictures.